4.99% APR promo balance transfer rate for 12 months with no balance transfer fee now through September 30, 2019. After that, the APR for the unpaid balance and any new balance transfers will be 11.99% to 17.99%. APR will vary w/the market based on Prime Rate. Subject to credit approval. $100 bonus after spending $1,500 in purchase transactions within the first 90 days of account opening. 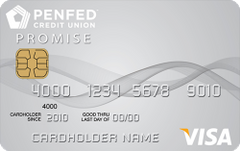 Our take: Though it offers a low APR and zero fees, the PenFed Promise Visa unfortunately lacks a zero percent introductory APR for new purchases.